BetaBatt was a Houston-based company in the business of developing long-lasting reliable power sources. The Company researched and patented a novel 3D energy conversion architecture named the DECTM Cell, based on nano-scale porous silicon. The DECTM Cell is able to convert decay electrons to electricity 10 times more efficiently than conventional 2D devices using standard semiconductor manufacturing methods. The company's first commercial product, a quarter size battery with a 12-20 year lifespan and mission critical reliability, was to have performance characteristics that address current problems faced by medical implant, oil and gas, and remote sensing industries, as well as military and space organizations. Subsequently, BetaBatt intended to apply its novel architecture to Micro-Electro Mechanical Systems (MEMS), Mesh Networks, Smart Dust and other micro/nano architectures requiring long-lasting reliable power sources. Semiconductor devices based on Direct Energy Conversion (DECTM) technology will generate electric current from a radioelement source. The efficiency of the DECTM Cell stems from its single step capture-and-conversion method. DECTM Cells use energy produced from the decay of a radioactive isotope, not a chemical reaction. The Company's patented architecture is based on the same physical principles that are employed in solar cells. The power source is an electron-only beta emitter that produces no external radiation for maximum useability. Thus micropower sources employing DECTM technology are as safe as chemical batteries and are an ideal replacement for a broad variety of industrial and medical applications. A key innovation is the distribution of the beta-emitting energy source throughout the DECTM Cell volume. This means that the current generation is not just a surface effect, but occurs everywhere within the active volume. Thus, DECTM current sources are extremely efficient, converting a large fraction of the available decay energy into electric current. 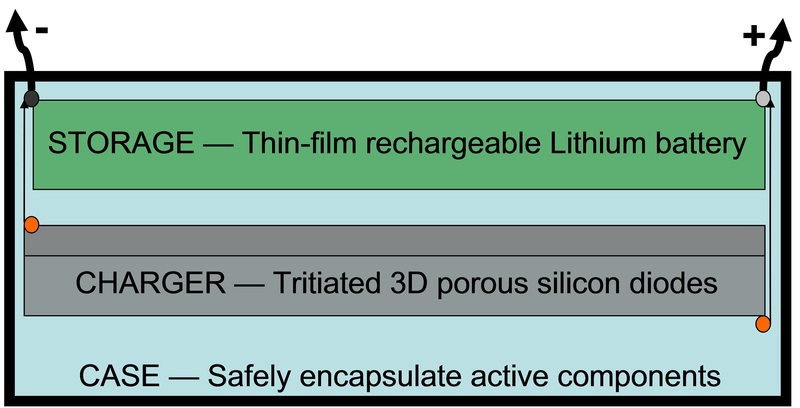 The first and second generations of tritium-powered BetaBatteriesTM are expected to produce 50- and 175-micro-Watts per cubic centimeter of active device volume, respectively, with the potential of attaining 2,000 µW/cm3 in future advanced development. BetaBatteryTM current sources are long-lasting, based on the selection of the beta source. Tritium has a half-life (T½) equal to 12.3 years. This means that after 12.3 years, the current output will be half its original value and a tenth of the original after 40 years. This productive life is orders of magnitude longer than chemical batteries. The decline in output for DECTM power cells will be quite predictable and can be accommodated by appropriate electronics design for each specific application. BetaBatteriesTM increase shelf life and ensure readiness by acting as a trickle charger, thus enhancing capability, reliability and useful life. TM A major advantage of DECTM power cells is their "always on" capability. This means they would be ideal for permanent or semi-permanent "install and forget" applications in remote or inaccessible locations. Another advantage is that DECTM technology is scalable. DECTM current sources could be used to power the smallest realizations of MEMS devices and sensors. 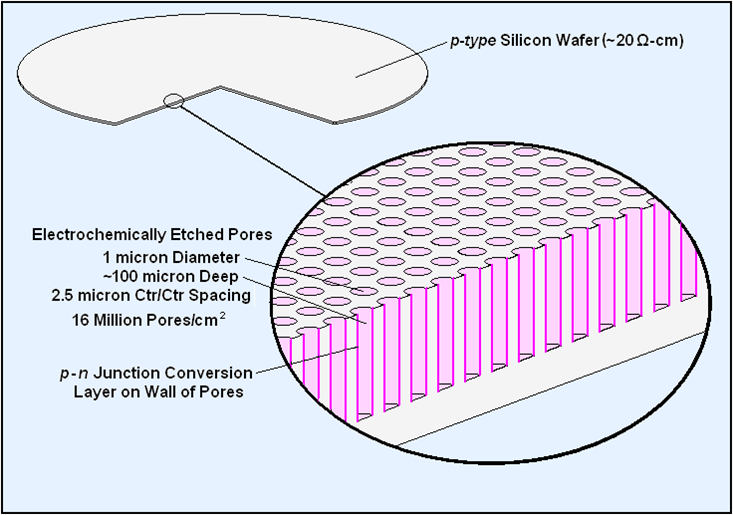 By selecting appropriately-sized semiconductor wafers and connecting the resulting DECTM Cells together, a very wide range of BetaBatteryTM power levels can be delivered. Another advantage of DECTM technology is that the high efficiency of energy conversion gives rise to a very small amount of waste heat. This means that in the majority of applications there will not need to be any extra design effort nor auxiliary systems installed to remove excess heat. Space-worthy DECTM technology has many advantages compared to Radioisotope Thermal Generators (RTGs) including high efficiency, little waste heat, low mass, no shielding requirements and a zero noise signature in all energy regions important for astrophysical investigations.